The Women's Health Initiative, a series of randomized controlled trials begun in 1991, was supposed to be definitive in terms of the role hormone-replacement theory would play in managing the health of post-menopausal women. However, the WHI has yielded unexpected and sometimes apparently inconsistent results. The medical establishment expected the WHI to show that HRT, which had been popular for years, helped prevent cancer, heart disease and osteoporosis in older women. Instead, in 2002 researchers announced in the Journal of the American Medical Association that they had stopped the trials, which involved more than 160,000 women, because participants receiving estrogen combined with progesterone were developing invasive breast cancer at substantially higher rates than were women receiving a placebo, and their rates of heart disease were also high. HRT, which to that point had been prescribed liberally for post-menopausal women, virtually disappeared as a therapy, in spite of the fact that it did seem to be helping women avoid hip fractures and colon cancer. Just last week, though, again in JAMA, a group of WHI researchers reported that a smaller study of women who have had a hysterectomy, who were treated with estrogen alone for a median of 10.7 years, showed a decreased breast cancer risk with the treatment, with no significant increase in heart disease. Well, that's disconcerting. Should post-menopausal women be asking their doctors about HRT after all? Probably not most of them. “Women are different — it’s relevant to almost every medication and almost every intervention,” Joann E. Manson MD told Tara Parker-Pope in a story in last Sunday's New York Times. “With this study, in many ways, science worked the way it’s supposed to work. It’s a little like watching sausage being made. It may seem on the surface that the study was a real problem and had many, many flaws, but in reality, it ended up giving invaluable information,” said Dr. Manson, a WHI investigator who is also chief of preventive medicine at Brigham and Women’s Hospital in Boston. Adds Pope, "The most compelling lesson of the research should be that science is always worth the wait. Consumers should insist that doctors make recommendations based on scientific evidence, say investigators, rather than allowing drug companies or marketing hype to dictate patients’ health care choices." That's true for middle-aged women, pregnant women, men and parents as well. 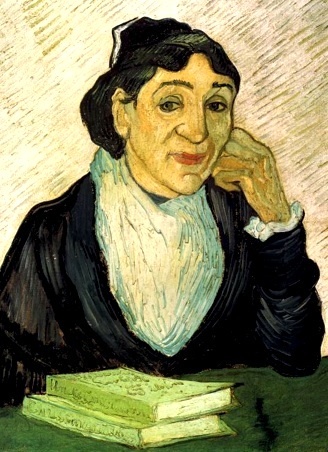 Image: Vincent Van Gogh's "L'Arlesienne"